area and provides excellent views as well as being an iconic subject all its own. American baseball great Yogi Berra once said (when giving directions to his house), "When you come to a fork in the road, take it." So when I saw this view, I did! I did not touch the saturation slider. Minimal post-processing. Billowing cumulus clouds build up on a spring afternoon following a storm. It is rare to see such depth to the sky in the San Francisco Bay area because clouds either are thick and rainy, or there are no clouds at all. As the sun set, the lift created by the warming ground eased and the clouds evaporated into blue sky. A winter storm dusted the top of Mt. Diablo with snow on February 20, 2011. 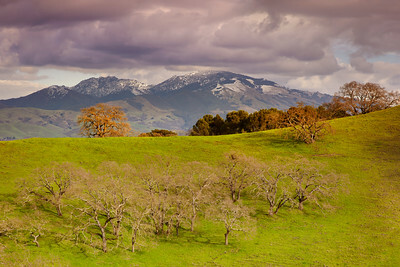 I did not want just 'a photo of snow on Diablo', but rather an entire composition with the structural dendritic branches of the oaks and some light showing off the Oak in front of Diablo. 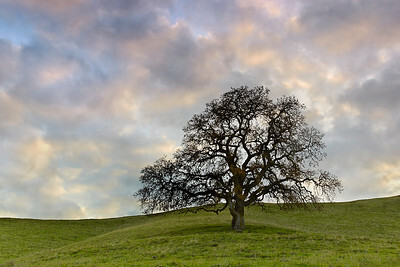 The sun sets behind a lone oak tree in Lafayette, California. Lone Oak #1 is a long exposure version of this image. A storm blew in some clouds off the Pacific and up the side of Mt. 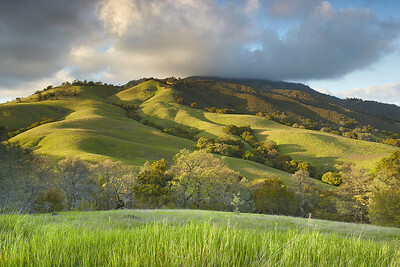 Diablo letting patches of light illuminate the woodland and grassland oaks. 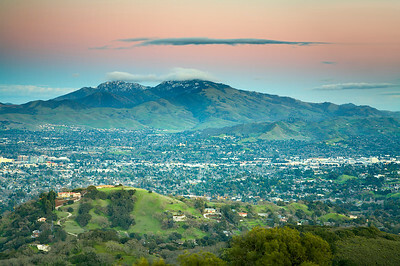 Walnut Creek is in the distance. A mist-shrouded Mt. Tamalpais can be barely seen on the horizon just left of center. A mid-winter storm provided some much needed rain and some much needed atmosphere too! After looking at the satellite movies and radar images, I decided to go up to Mt. Diablo in hopes of the clouds clearing up just before sunset. Fortunately for me, they did. Even a few minutes before I made this image, the light was rather dull but I could see a hole in the clouds developing. I parked the car out of sight on the road below and ran up and down the hill until I was high enough above the fog bank to see the light over the top of it. 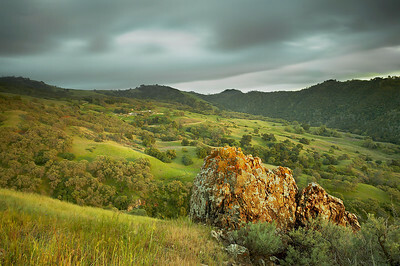 Then I ran around looking for the best composition that showed the rolling shapes and contours of the landscape. I'm glad that nobody saw me because they would probably think I was crazy because I kept running around frantically trying to find the best spot in case the sky opened up at the last moment! After a small late-season storm rolled though the valley, a hole opened up in the clouds allowing Mt. Diablo to be spotlighted. 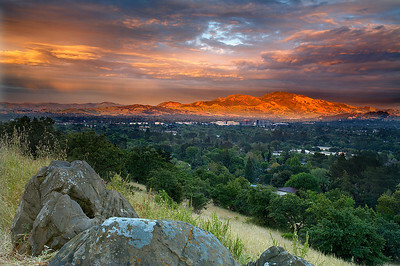 Pleasant Hill is to the left and Walnut Creek is to the right. I've lived a few blocks from here for 5 years and this is the best sunset I've seen. Most of the trees in the valley are planted. It was dry and barren before people arrived. 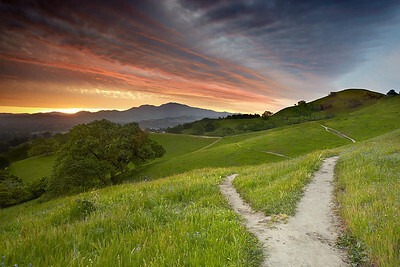 This was the path to take in order to get a superb view of an unusual sunset spotlighting Mt. Diablo. 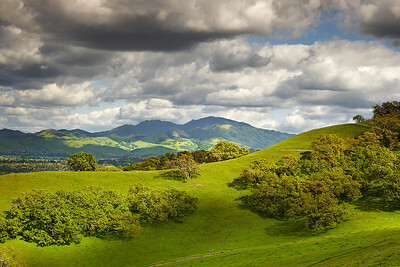 Taken in the hills above Pleasant Hill, California. This happened just after I made Diablo Dusk as the sky continued the best light show I'd ever seen here. 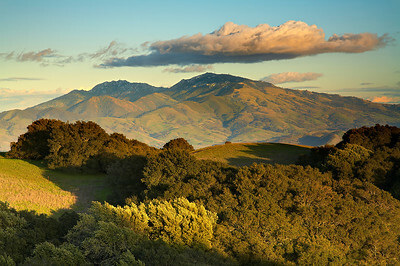 Just before sunset following a winter storm, I ran up the hill in Briones Park to see a snow-capped Mt. Diablo in the last light of the day. It was the coldest day of the year and it had snowed a bit earlier in the day. I was hoping that the snow would stay around until sunset and fortunately, it did!. I had to run around a bit looking for a pleasing composition and I finally found this scene. 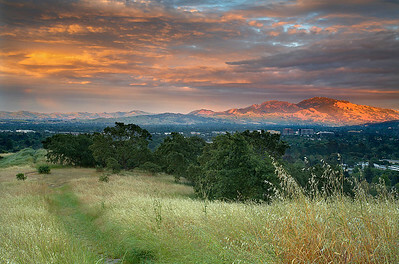 After sunset following a winter storm, a snow-capped Mt Diablo is bathed in Alpenglow as the dark blue shadow of the earth rises into the evening sky. This phenomena occurs about 20 minutes after sunset when the air is extremely dry and clear. 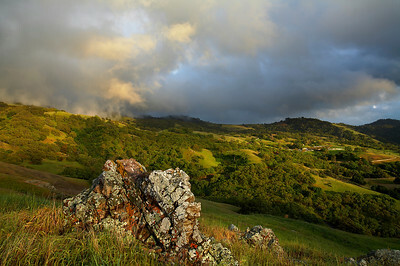 A long exposure shows movement in the clouds and foreground trees. This long exposure allowed me to capture the soft light and mood as it came through the rapidly moving clouds. I had to wait a while for the light to become even so that the image would look like an old painting. 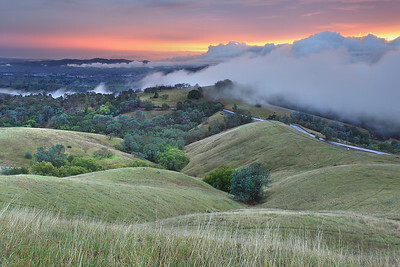 This short exposure shows the mist as it rises up the west slope of Mt. Diablo after a late winter storm. The last bit of sun for the day came through a hole in the clouds, illuminating the rising mist and the farm to the right. I had to climb about 1,200 feet up the side of the mountain to get to this spot. This was the Schooner Forrester, the last intact schooner on the Pacific coast. She was launched in late 1900 and was used for years to haul lumber from California, Oregon and Washington to China, India and Australia. 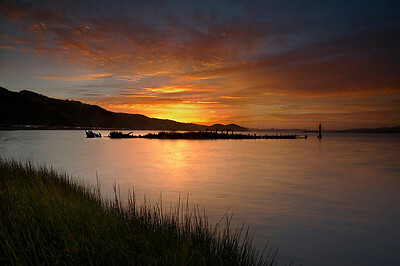 In 1935, the first and only captain of the ship beached the Forrester on the mud flats near the city of Martinez, northeast of San Francisco, to live out his days. In 1975, the ship burned to the water line and sits just offshore to this day. A rare December snowfall covered half of the mountain while the last of the fall foliage from the street trees holds on for one last show. Fortunately, the clouds stayed long enough to provide a nice light show as the sun set behind the camera. 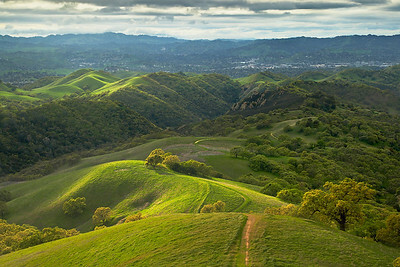 There are seemingly endless trails winding their way through the hills and valleys around Mt. Diablo. And sometimes as you hike, your view opens up to vistas like this where a bit of low light can make you stop in your tracks and take it all in. 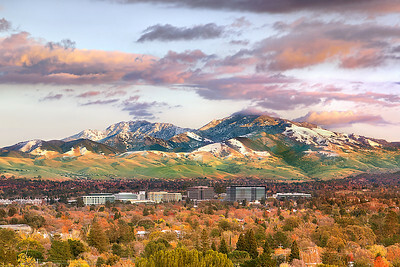 2 images stitched together for an extra wide view. (Repeated description from #2) Lafayette reservoir is a beautiful place, but it is difficult to find an open view along the shoreline where you can place your tripod on solid ground for a sharp and long exposure. But if you look, you can find them. The wind created patterns in the water and the long exposure shows the direction of the wind and the colors reflected from the hills and sky. Third in a series. 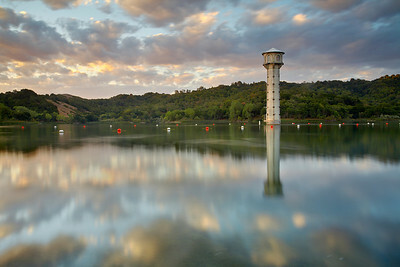 Lafayette reservoir is a beautiful place, but it is difficult to find an open view along the shoreline where you can place your tripod on solid ground for a sharp and long exposure. But if you look, you can find them. The wind created patterns in the water and the long exposure shows the direction of the wind and the colors reflected from the hills and sky. Second in a series. 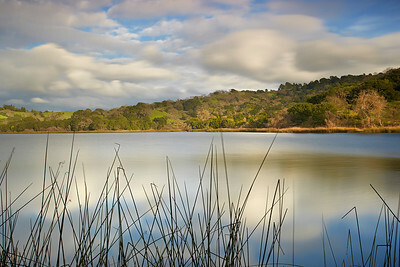 The Lafayette Reservoir, about 15 miles east of San Francisco is a great place to take a hike. Trails go all the way around the lake and into the hills behind. 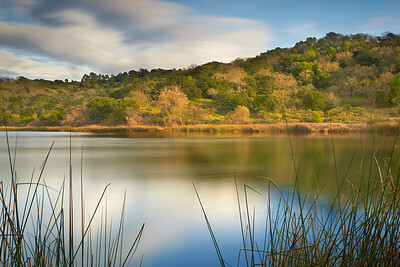 A long exposure allowed a more impressionistic view than an exposure at a normal exposure time could produce. This is how it felt to be here on this beautiful morning. First in series. I hiked up about 1,000 feet up the hillside in the driving rain to get to this preplanned place because I hoped that the storm would clear just as the sun set. It did! It was an amazing sunset so I pointed away from it, towards the mountain. 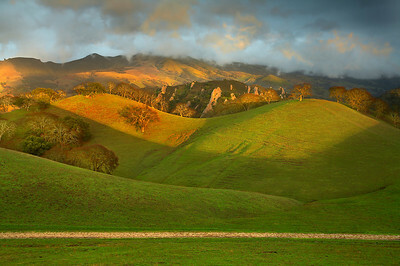 I like the light on the row of oaks and how it spread across the landscape.